A grant deed, also referred to as a bargain and sale deed, is a legal document used to transfer, or convey, rights in real property from a grantor (seller) to a grantee (buyer). Idaho does not provide a statutory form for a grant deed, but the statutes identify the warranties implied by the word "grant" in a deed. 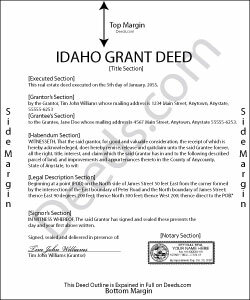 In Idaho, the word "grant" guarantees that previous to the execution of the conveyance, the grantor has not conveyed the same property, or any right, title, or interest therein to any person other than the grantee, and that the estate is free from encumbrances at the time of execution of the deed (I.C. 55-612). Therefore, if the grantee later discovers that the grantor has sold the property to a third party, or if there are encumbrances not mentioned in the deed, the grantee can sue the grantor to recover the value of the property. In addition to meeting all state and local recording standards, the deed must include the grantor's full name and marital status, as well as the grantee's full name, marital status, mailing address, and vesting. Vesting describes how the grantee holds title to the property. For Idaho residential property, the primary methods for holding title are tenancy in common, joint tenancy and community property. A grant of ownership of real estate to two or more persons is presumed to create a tenancy in common, unless a joint tenancy is specifically created (I.C. 55-104, 508). Property conveyed to a married couple vests as community property (I.C. 32-906). A lawful grant deed must be signed by the grantor and contain an acknowledgement. Acknowledgements may be made at any place within the state of Idaho, before a justice or clerk of the Supreme Court, or a notary public, of the Secretary of State, or United States commissioner and must meet the requirements as set forth in I.C. 55-707. Once acknowledged or proved and certified as provided, it should be recorded in the recorder's office in the county where such lands are located. If left unrecorded, a grant deed is void as against any subsequent purchaser or mortgagee of the same property whose conveyance is first duly recorded (I.C. 55-812). This article is provided for informational purposes only and is not a substitute for the advice of an attorney. Contact an attorney with questions about grant deeds or any other issues related to the transfer of real property in Idaho.